Gunshow: Eclectic dim-sum in the Deep South. Gunshow Atlanta has been on our bucket list for a long time. How long you might ask? Nearly a year. Gunshow takes reservations a month out. But with my traveling back and forth between Austin and Atlanta, it hasn't been easy to pinpoint a set date. Finally this glorious November, I landed a timely reservation to celebrate both Jonathan's birthday and our 5-year anniversary. Kevin Gillespie's Gunshow serves chefs' creations in a dim-sum style, where food is brought to your table either on a cart or tray. When you are first seated, the server will present you with the current week's menu, detailing out all of the evening's dishes with pricing. Chefs walk around with their masterfully crafted creations and tell guests the story behind each plate. If you decide to order, they mark your ticket. If you like to try a bit of everything (small dish style), this is the place to go. Dishes range in style from Asian to Italian to Peruvian... all with a hint of Southern flair. Gunshow is a place where you'll easily want to order every dish off the menu. Check out all of the dishes we ordered in the slideshow below. Quite possibly our favorite dish of the night. This fusion of a southern classic with an Asian twist is a must-order, if available. This take on the traditionally heavy Irish bar dish is surprising light, yet comforting. Juicy, hot beef is topped with steaming smashed potatoes. This mild-tasting fish is a buttery delight for fish lovers and non-fish eaters alike. It tastes like a bird with texture of fish fillets. Garnished with parsnip, bacon-roasted greens, and grapes. This Peruvian-inspired dish with plantains and shrimp is like a mouthful of southwestern tortilla soup in solid form. Yes, you read that correctly. A simple, yet bold kale salad with sous vide egg as dressing, bacon, shallot, and cheddar frico. We love this as great starter or intermission dish to change up the pace. 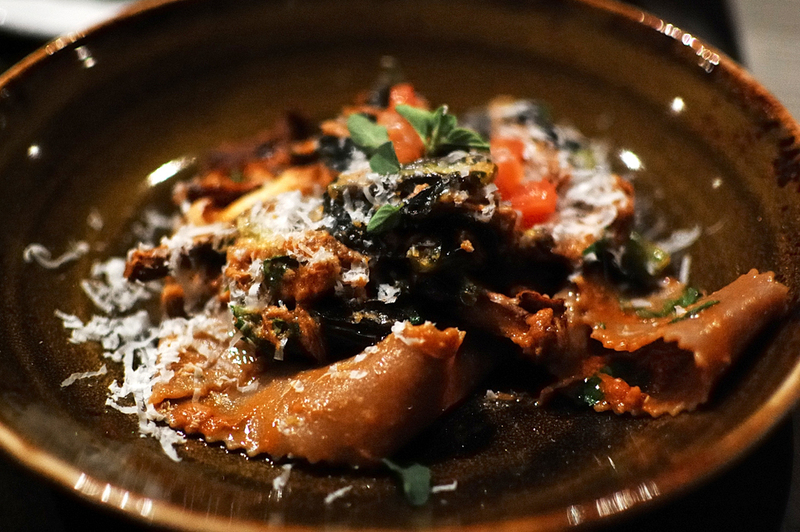 Handmade pasta with pork sugo, mushroom, mustard greens. This was an incredibly aromatic dish with a mildly spicy kick. In the words of my husband, "It was crazy! I wish I had more!" Cranberry, hazelnut, brown butter, and shortcake that simply melts in your mouth. Slightly more acidic than its dessert friends on the menu, this panna cotta is somewhat reminiscent of a white chocolate Christmas.